Who should Sixers fans be rooting for in Celtics vs. Bucks Game 7 on Saturday night? Milwaukee Bucks forward Giannis Antetokounmpo passes the ball around Boston Celtics center Aron Baynes during the fourth quarter in game six of the first round of the 2018 NBA Playoffs at BMO Harris Bradley Center. Compared to the congested schedule the Sixers have found themselves in over the last couple months, the end of April has felt like a damn vacation. After knocking off the Miami Heat in Tuesday's Game 5, the Sixers have had the luxury of just sitting back and watching things unfold around them. They'll be home watching with everybody else on Saturday night, awaiting the winner of the do-or-die Game 7 between the Milwaukee Bucks and Boston Celtics.Knowing they could face either team, most Sixers players and staffers have been coy about who they expect to face or who they'd rather face, not wanting to provide a potential opponent with bulletin board material. Even when they make a concession — as Ersan Ilyasova did on Thursday — the players have mostly highlighted a desire for homecourt advantage above all else. But those of us who sit on press row, the stands, or from home don't have to worry about irritating or provoking the likes of Giannis Antetokounmpo. So let's answer a very simple question — who should you be pulling for in Saturday night's Game 7? On balance, the Celtics have been a significantly better team than the Bucks have this season. There is basically no way to dispute this — Boston won 11 more games than Milwaukee in the regular season, and was closer to being the best team in the East than they were to the Bucks. But this is definitely not the same Celtics squad that took the league by storm to start the year, primarily because they're missing one of their most important ingredients. Kyrie Irving, once a fringe MVP candidate, is out for the season following procedures to address issues in his knee, and his absence is one Boston is not equipped to make up for. He was the only high-level creator Boston had on the perimeter, and without him the Celtics are forced to create by committee with a group of players who are either incapable of doing so or are too young to do it consistently yet. That's not a knock on Boston's talent, because Jaylen Brown and Jayson Tatum have both exceeded expectations this season in the absence of star acquisition Gordon Hayward. Forced into higher usage roles after Hayward went down with injury, Tatum and Brown have improved with the increased reps they've been afforded. They will be a thorn in Philadelphia's side for years to come, and even more dangerous when alongside Boston's other perimeter stars. But both are a bit overextended in their current roles, as most young players would be if placed into an environment where they have to pick up the slack for veteran stars. Polished as Tatum is as a scorer, he's still fairly early in his development as a playmaker off the dribble. He's a very good team offensive player, and is excellent at identifying spots when he should make the extra pass or take a shot himself, but off-the-bounce his limitations from a vision perspective are a bit more apparent. There are still many times when he gets himself in too deep and doesn't really know what to do once he's there. The Sixers would be able to expose these shortcomings in ways the Bucks have, only on a more consistent level. After playing an aggressive, blitzing style for most of the season, the Bucks have joined a lot of the NBA (including the Sixers) in these playoffs by switching on most pick-and-rolls. 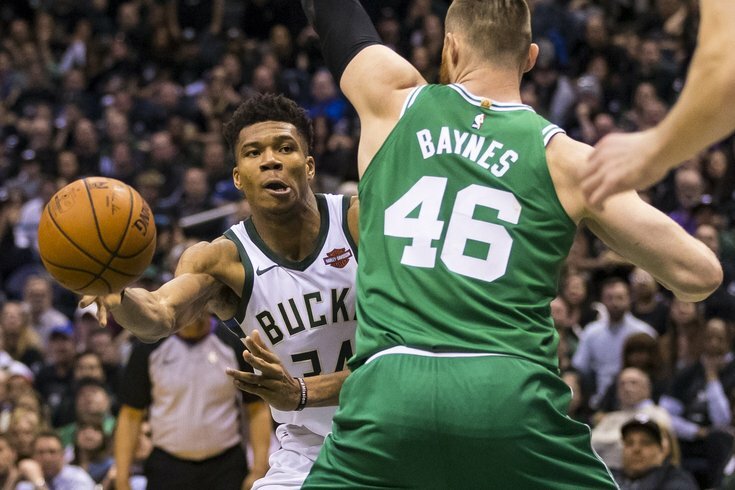 Rather than trying to use their length and athleticism to force steals at the cost of lots of easy buckets, the Bucks have instead bet on those same tools being able to bother Boston in a halfcourt setting. It's working out just fine through six games. The Celtics currently rank in the bottom-six in offensive efficiency in the opening round of the playoffs, with four of the other five teams having already been eliminated from contention. With players like Tatum and Brown asked to create more off the dribble, the Sixers have the wing athletes and rim protection to cause chaos in the halfcourt and get out on the break. Joel Embiid is one of the league's best deterrents at the rim, and when offenses reset you have Ben Simmons and Robert Covington to dart into passing lanes and hit the break the other way. Without Irving, the Sixers can claim they have the two best players in the series outright, which always matters a ton, as we saw in the matchup with the Miami Heat. Boston is a well-coached, disciplined team, but they don't have a player who can tilt the court in his favor single-handedly over the course of seven games. For all Milwaukee's flaws, they have one of those guys on the roster and can hit a peak Boston is currently unlikely to reach. Other injuries to Boston have hurt their ability to deal with some of the matchup wrinkles the Sixers can throw at the Celtics. Daniel Theis was a valuable member of the rotation who could defensively counter lineups featuring Ersan Ilyasova at the five, but he too was knocked out of the picture by knee surgery. Starter Al Horford is mobile enough to track that assignment, but Brad Stevens would almost certainly want to get him rest in order to keep pace with Embiid-led lineups. There's also the intangible side of things. Boston is one of, if not the most hated rival the Sixers have as a franchise, and Boston fans were happy to take victory laps mocking Philadelphia fans earlier this season as the Sixers' young players struggled to find their way early on. The hometown club sending the Celtics and those fans packing would add a little extra zest, as does mentioning that the Philadelphia Eagles defeated the New England Patriots in the Super Bowl this season, which some people may forget. Put simply: Boston's reliance on young players, the absence of their offensive star, and extra juice in the future matchup give Sixers fans plenty of incentive to pull for a Celtics battle. While Philadelphia's view of the Bucks is slanted because of the blowout Philadelphia handed them on the last day of the season, Milwaukee is almost certainly a worse team with lower valleys than the Celtics. In tough times, Boston has a defensive identity to fall back on and a top-notch coach pulling the strings. Milwaukee's defense is much more erratic, and the operator behind the controls is a lot less inspiring. The former part of that equation is a product of scheme (the aforementioned over-aggressive blitzing), personnel, and Joe Prunty's combination of the two. There are simply more players on Milwaukee's roster who engage in, charitably, some bouts of lacking defensive awareness. Jabari Parker is easily the biggest culprit of this, choosing to ball watch and loaf around rather than contribute anything of value on that end. The Bucks have changed their defensive responsibilities within this series, which has helped them stifle a Boston offense they're perfectly equipped to stop. But there's plenty of debate to be had about whether that's Milwaukee flexing their muscles or the Celtics simply running out of bodies with which to create good offense. Personally, I lean toward it being the latter. The tape seems to suggest this is the case, anyway. Boston has done a perfectly adequate job of creating open looks for themselves, but sometimes the ball is finding its way to the likes of Guerschon Yabusele. With all due respect to the young man, he's not exactly the guy the Celtics want catching the ball with a three-point shooting opportunity. With the depth of shooting the Sixers have at the moment and the amount of dribble penetration the Bucks allow, things could very quickly turn in Philadelphia's favor, as they did in both of the home blowouts the Sixers handed Milwaukee this season. The key in a Milwaukee series would simply be keeping your turnovers down. Unlike the Miami Heat, the Bucks are fairly adept at turning your mistakes into points on the other end, thanks to the one-man transition show that is Antetoknoumpo. The wrinkles in Milwaukee's lineups are mostly things the Sixers would be happy to live with. Giannis at the five has been leaned on for stretches against the Celtics, but the key to that lineup being sustainable for Milwaukee is not getting killed at the rim on both ends. Opponents shot 72.1 percent at the rim with the Greek Freak at center this season, per Cleaning the Glass, and those lineups ranked in the bottom one percent of all five-man groups at offensive rebounding. The Sixers — built around a dominant center and a bulldozing 6'10" guard — could shred these sorts of looks. There's also the matter of homecourt advantage, which would swing back to Philadelphia in the event that Milwaukee emerged victorious against Boston. We should maybe not overemphasize this if the Bucks walk into Boston and earn a Game 7 win, but the home team has won every game in the Boston-Milwaukee series, which was the case for all of the games between Milwaukee and Philadelphia this season as well. The Sixers have been borderline untouchable at home since Christmas, and getting to start the series at the friendly confines of the Wells Fargo Center would be a nice boost for a young team that will have had almost a week off between games. There is an interesting philosophical debate underneath all of this about what you think matters more in a playoff series between top-end talent and coaching. Boston represents a choice more in the mold of Miami: a smart, defensively-stout team that you can expect to play at a B or C level for most of a series, while rarely rising up to A+ or sinking down to an F. The Bucks are higher variance, but when Antetokounmpo is at his best they are downright terrifying. Ultimately, though, I think you lean toward Milwaukee if you're solely concerned with Philadelphia having the best chance to advance. Yes, Irving was a monumental part of why the Celtics were a comfortably better team than the Bucks over 82 games, but he is far from the only reason, and it would be silly to dismiss Boston as a one-man show. With homecourt on their side, the Sixers have the top-end star to match Giannis in Embiid and the secondary guy in Simmons who I would take over Kris Middleton or any of Milwaukee's other supporting cast members. The Bucks are the more high-variance team, and with Philadelphia owning the coaching advantage against them I would bet on Brown to figure out a way to put Milwaukee on tilt more often than he could against Boston. The Sixers should be favorites against whichever team emerges from this series, and they will be well-rested when their season continues on Monday. But they should not and will not take either of these teams lightly, and they would be wise to be cognizant of their own youthful indiscretions before jumping for joy at whatever matchup they get.